I was raised to be independent and self-sufficient. I had my first job when I was 12. I loved that it gave me a little bit of financial freedom from my parents. Even as a child I knew that it would be my responsibility as an adult to earn the money to buy the things that I wanted. It never occurred to me to expect a husband to do it. As a young woman I knew women who married and stayed at home, some with children and some without. Some of these women were my age, some my mother’s age, and some were older. I thought it was risky to be totally dependent on someone else, but I didn’t think too much about it beyond that. 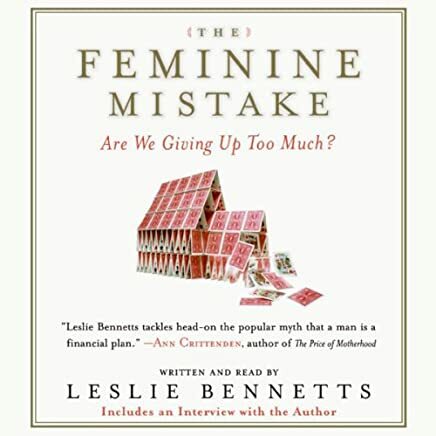 That is, until I read Leslie Bennetts’ book, The Feminine Mistake: Are We Giving Up Too Much? This book was such an eye-opener for me. It described, and backed up by research, all the risks associated with being totally financially dependent upon a husband. And the risks were not just for the present, but for the woman’s entire future. Unfortunately, divorce happens. Death happens. Disability happens. Unemployment happens. If it happens in a family with two incomes, it’s bad enough. But if it happens when there is one income-earner, it’s worse. Even taking a break from work for child-rearing has financial consequences. The woman who does is never going to be able to catch-up on ten (just to pick a number) years of experience that other people have that she doesn’t. She’ll never catch up on ten years of contributions to a company. She’ll never catch up on ten years of company or industry advancements. That will be reflected in her pay for the rest of her career. It’s also ten years of lost income that won’t be reflected in social security or retirement investments. Bennetts also discusses less tangible advantages of working such as the intellectual, psychological, emotional, and health benefits of being self-sufficient. We can’t make good decisions with missing or inaccurate information. Bennetts’ book provides information to help us make better decisions. It can help us in determining what the true costs of our decisions are. We might decide to make the same decision, but at least we will know what to expect. Some of you reading this might think it’s too late for you. But it’s not too late for some girl or young woman that you know. Read the book for her sake, if not yours. If she is young, open her mind to what might be new ideas and thoughts—that she can have it all, that she can do it all. Encourage her to think about what different careers pay. Boys usually consider money when choosing a career. They are raised to think about supporting themselves and a family. Too often girls are not and choose careers that don’t pay well without considering the financial ramifications. Too often there is the subconscious thought that she will have a husband to support her and so her income won’t really matter. It will. If she is an adult, give her a copy of the book and discuss it with her. She will thank you, even if she never tells you.